New Year’s luck traditions from many cultures. 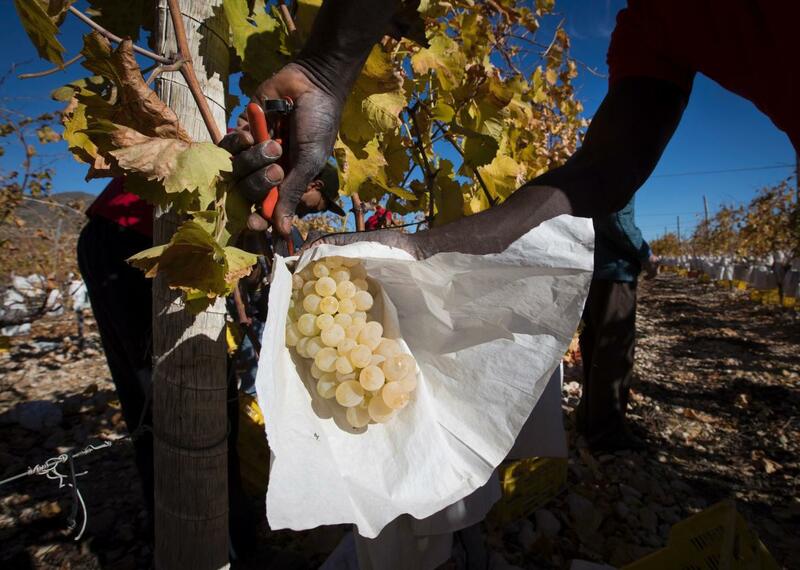 Employees harvest Vinalopo grapes at a vineyard in Novelda, eastern Spain, on December 26, 2016. In a nearly century old tradition many Spaniards eat 12 Vinalopo grapes as midnight strikes on New Year’s eve, lured by the promise of good luck to those who manage a grape and wish per chime. We have many traditions in the Price household. Most of my dad’s revolve around the West Virginia University Mountaineers, leaving the holidays infused primarily with my mother’s spirit (and maybe a bowl game, if we’re lucky). Food is my family’s primary love language, so our holiday habits largely revolve around meal staples. We eat chocolate bunnies at Easter; we’ve fired up the grill for Memorial Day, July Fourth, and Labor Day; we don’t eat turkey at Thanksgiving when a perfectly delicious rosemary chicken fits neatly in the table space left by a dozen side dishes. We’re also a mixed-culture family, combining Filipino and West Virginian and French and regular Virginian, plus this adorable pre-meal rhyme from my sister’s kindergarten in Rhode Island. But nothing else illustrates the nature of my family’s melange of holiday habits quite like New Year’s Eve. My mother, who grew up in the Philippines, learned a variety of ways to celebrate holidays that originated in other countries—but I probably couldn’t say where they all came from. The practice of eating long noodles on New Year’s Eve of the Gregorian calendar has been part of the official observation in Japan since the late 1800s, though eating long noodles for the Lunar New Year just a few weeks later to promote good health, luck, and longevity is a well-known custom in many Asian nations. And China actually introduced noodles, the food, to the Philippines, so there’s that. On New Year’s Eve, we eat bowls and plates full of long noodles (normally her amazing chicken pancit bihon, but sometimes just her also-amazing shrimp fettuccine) as a way to gain even just a little spiritual leg up on our futures. Nobody looks good while eating noodles, and we are no exception, but there’s something extremely comforting about the idea of food nourishing both our physical and spiritual selves. Based on all the pancit I’ve eaten over the years, I should be edging toward immortality by now, anyway. My mother has made deviled eggs for celebrating the New Year, too—a take on signifying new life that I can totally get behind. No midnight countdown is complete without the annual grapes, either! Ideally just before midnight, or while the clock strikes, but sometimes after if we forget, I eat 12 grapes for luck. They’re probably green grapes, because they’re my favorite and my family hates seeded grapes, and I definitely stopped trying to cram all 12 grapes in my mouth after maybe choking once. There was also the time I remember my mom feeding me the grapes because I’d forgotten about them. I’ve never empirically studied the effects of whether eating 12 seedless grapes on New Year’s Eve actually affects my luck and success versus my workaholic tendencies and solid support system, but I sure love those grapes after eating a full meal of things that are not fruits, making the annual lucky grapes a very refreshing snack. This tradition has easier roots to track, too: Las doce uvas de la suerte are a well-established Spanish custom, and Spain has a well-established track record of influence on the Philippines. When the noodles are eaten, before or after the grapes, we spiritually shake down our home by scaring away bad juju/evil spirits/negative energies by making as much noise as possible, usually accompanied by cacophonous banging on pots and pans (and one time this ornate bell I received as a gift). It’s a cheap and safe alternative to setting off celebration fireworks in our cul-de-sac, and it gave my sister and I really great reasons to bang pots and pans, an activity that is generally frowned upon other days of the year. My mother wants the best for us, she’s said. It’s why we also eat long noodles on our birthdays, and why I bought a bushel of green grapes for luck when I moved into my first apartment. After what feels like the longest year ever, I am struck by how much I’m looking forward to carrying on these moments for the rest of my life. And in each of these little, lucky traditions, I see her hopes and wishes for my sister and me, her Pinoy-Fairmont-Franco-Fredericksburgian kids, as well-meaning and tasty reminders that the real luck lies in our family. We are lucky. I am lucky. So Happy New Year, evil spirits: Now get out of my house and don’t come back.